Making your booking on the Savannahlander is easy – give us some information and we do all the hard work for you! 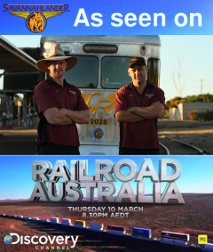 We have lots of capacity on the train itself, but accommodation in the outback can sometimes fill up in peak periods. Use the form below and one of our staff will check the available options and get in touch to confirm your booking. Once your details have been confirmed your ticket and voucher numbers will be emailed to you along with an invoice. Please note that places are limited – we will process all bookings in the order that they are received. Once places are full, we may offer you an alternative date or package as indicated by you on the form below. Deposits are required for all bookings of $100 per person – you will be forwarded to our paypal payment page once your booking is submitted (full payment is only due 30 days prior to departure). This is a non-refundable deposit, except in the case where we cannot supply your chosen tour. If we cannot supply your tour we will refund your deposit in full. Full payment for your tour will be due in the month prior to travel. If you are a tour or booking agent we would love to work with you. We have an online agent booking portal which you can access by signing up to our agent’s newsletter. It’s free, no spam and you can unsubscribe any time. How did you find us? *: ---Web Search.Travel Show.A friend told me.Link on a web site.Saw you on TVOther. Check here if you accept our booking terms and conditions.